Doing what you love doesn’t mean that it will always be perfect, nor that some difficulties will never cross your path. But when you love what you do, you have a certainty in your heart that you’re doing the right thing because when you look deep inside, it feels right. 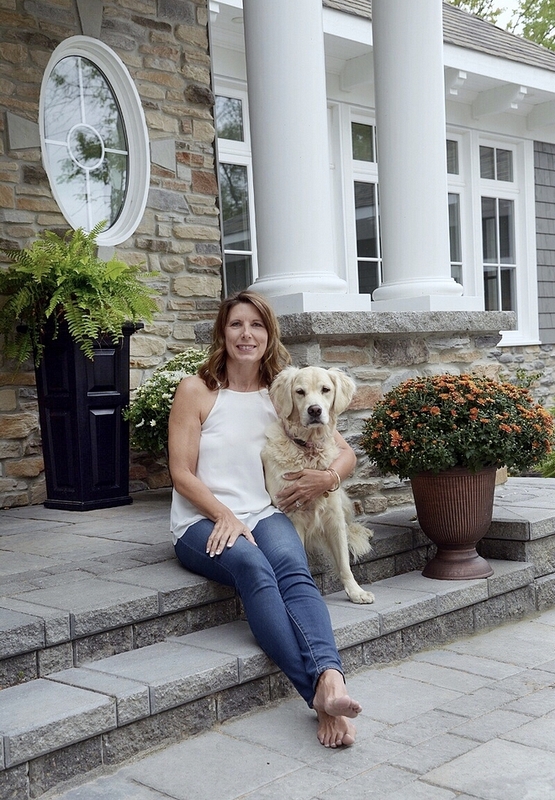 Creating the “Beautiful Homes of Instagram” series has allowed me to share not only inspiring interiors, but also inspiring stories and I am happy to have Pamela of pamela.saumure on the blog today. In fact, I was just talking to Pamela and I thanked her not only for all of the hard work she put into this feature, but especially for truly capturing the essence of this series. 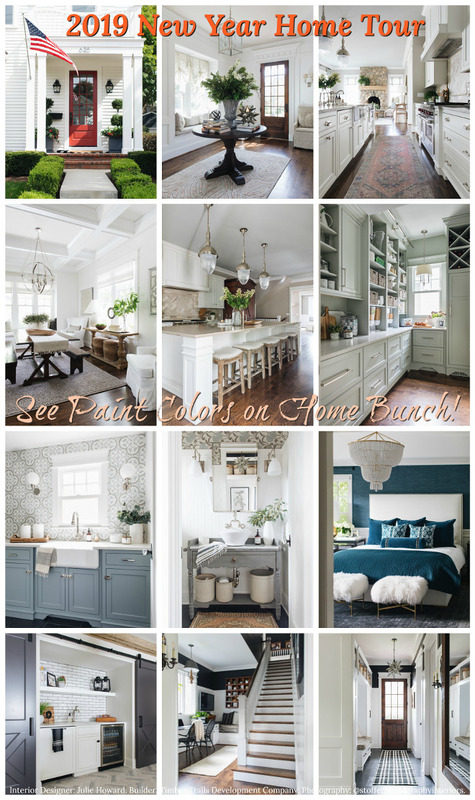 This is a space where I want you, the Home Bunch readers, to get to know the homeowner, how they live, how they decorate. 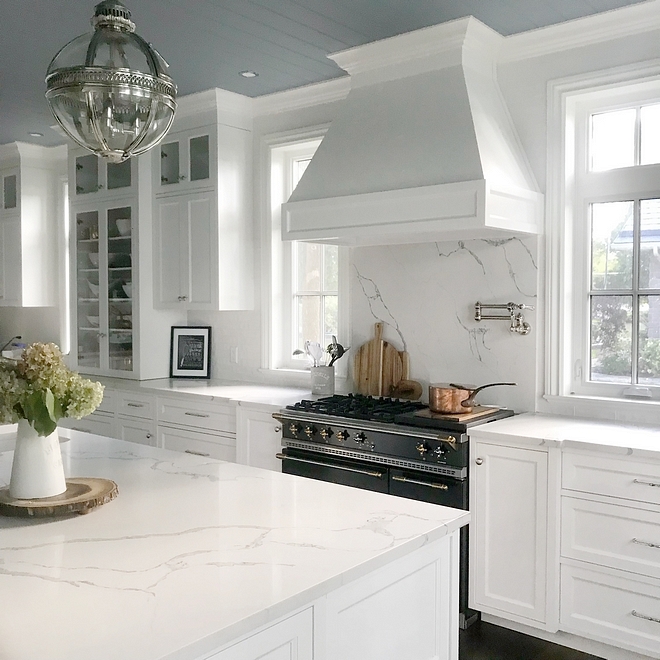 It’s an opportunity for us to learn from real people – people like you and me – people that share the same passion for interior design and most importantly, the same goal of creating a happier home. Real people are not looking into creating a home that is perfect, one that looks pretty but feels cold on the inside, and I am a big believer that this series is so unique and original because it showcases homes of people that have a warm heart and create a home equally warm, where not only beautiful decor exists, but where real love grows… Pamela’s home is a good example of that. “Hello friends, my name is Pam from @pamela.saumure. I can’t express to you how grateful and excited I am to be contributing to this inspiring series. To have our home featured alongside other homes that belong to some of my favourite Instagram accounts is truly a huge honour. 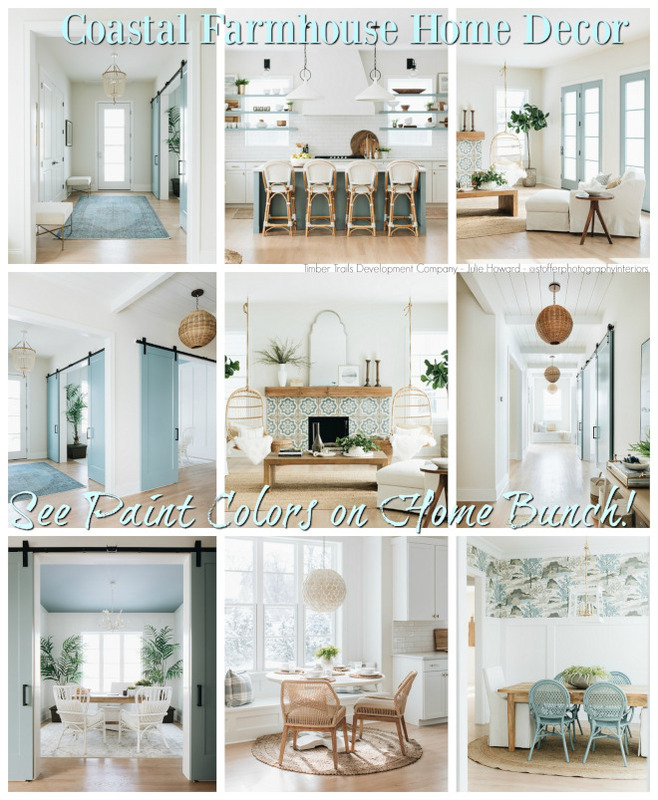 I can not thank Luciane enough for this amazing HomeBunch series that not only inspires me, but also inspires so many others with every article she writes. My husband Chris and I grew up in rival towns about 15 minutes away from each other. We’ve been married for 28 years and have three grown daughters and a golden retriever. We’ve always lived in the area but closer to “his“ town. Building or renovating is not new to us, as Chris grew up in the construction industry. His father began a home building business almost 40 years ago, and now Chris is Vice President of the company which now focuses on commercial development along with our own property development. In late 2016, we became empty-nesters and it was time to sell our “farmhouse“ style home that we built about 15 years ago and downsize. 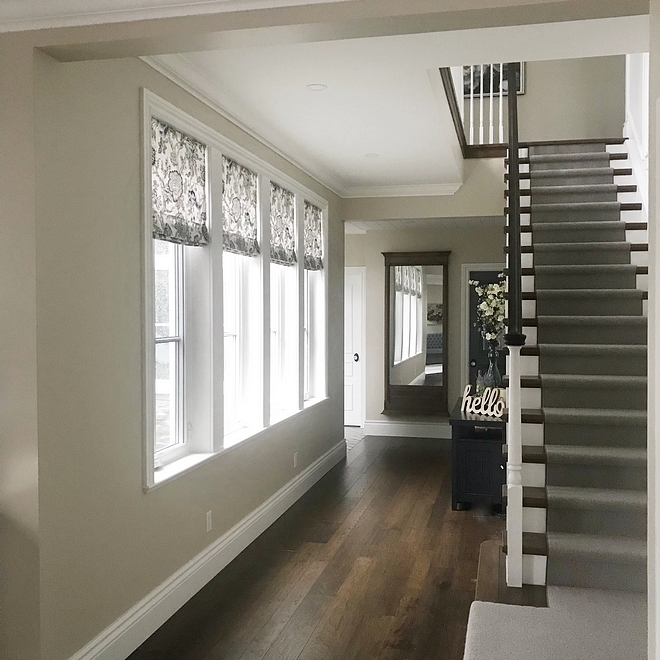 I had reservations about selling our home that we raised our daughters in and struggled about where would we would move to or what style of house we would build. 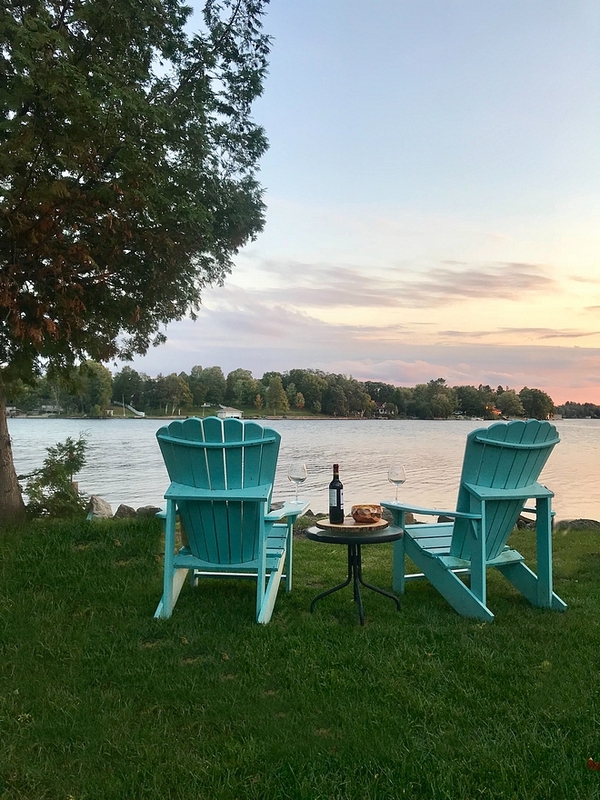 We had always considered living on the water but finding waterfront property that was “perfect” and affordable is almost impossible, so when the opportunity to purchase this current property with an old cottage on it came up, located on the Big Rideau Lake, in a little village with lots of heart, we jumped at the chance. So, we had the property, now we just needed a style of home to build. 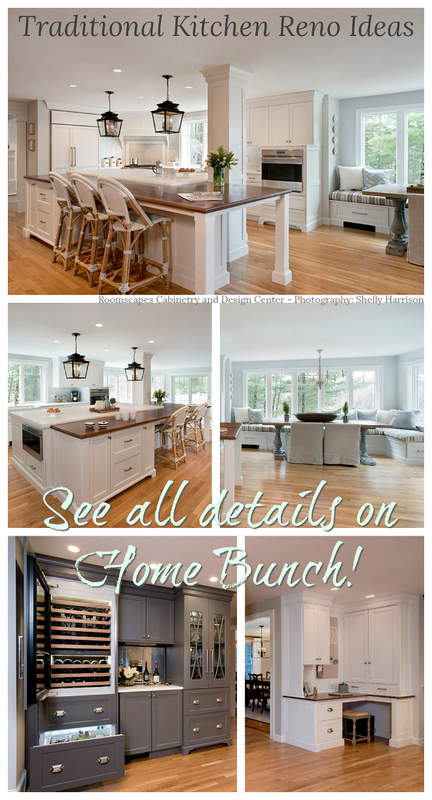 I spent hours looking at all of the homes on the HomeBunch website. 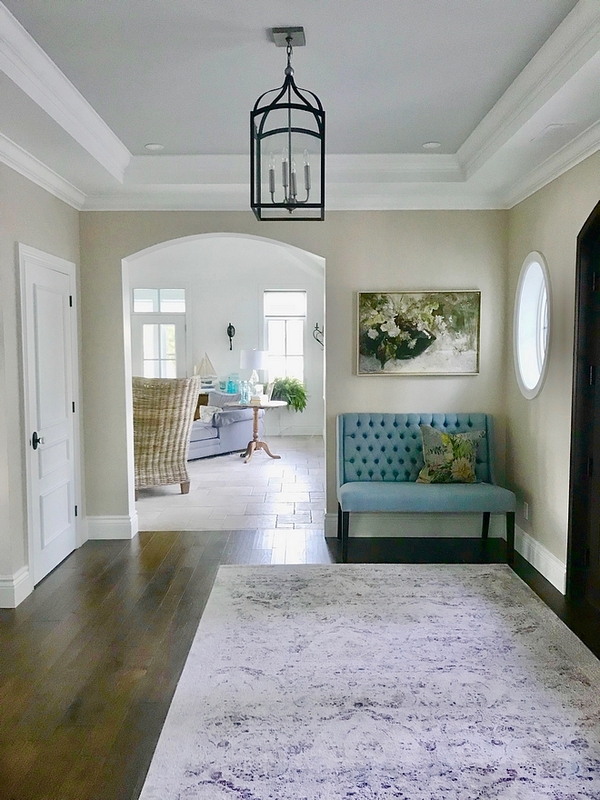 I was so inspired by the talent and beauty of so many and fortunately was able to take bits and pieces from each home I loved and give it to our company’s draftsperson, and have him design our own home. I enlisted the help of my best friend Michelle, along with Maire of Elizabeth Interiors, a local interior designer, and her assistant Terri. 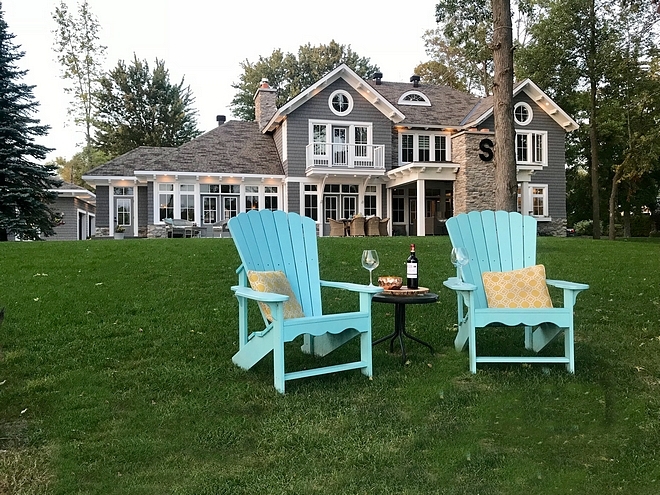 I have transitioned from a modern farmhouse look that I had previously designed in our other homes to a traditional lake home look, with a bit of a French feel on the inside that inspired me after several trips to France. Our home is located on a flat waterfront lot at the end of a quiet road on a point. 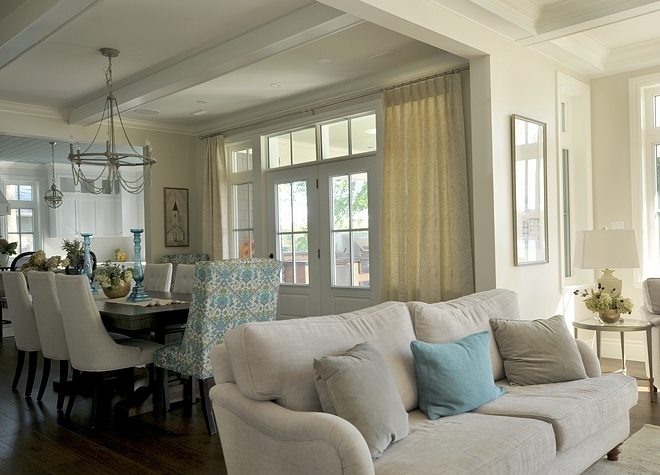 We are surrounded by water and are fortunate enough to enjoy a peaceful lake view from every window in our home. 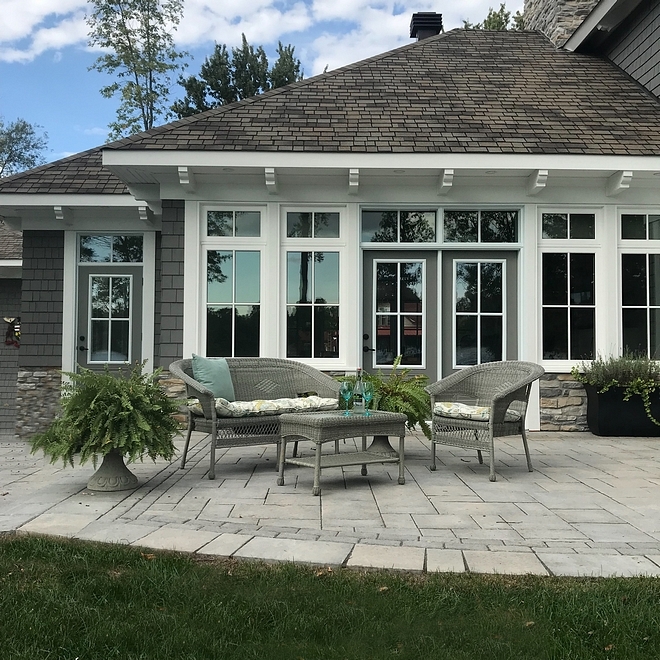 You might recognize her porch, recently featured on Home Bunch‘s 2018 Fall Decorating Ideas post. What an entrance! 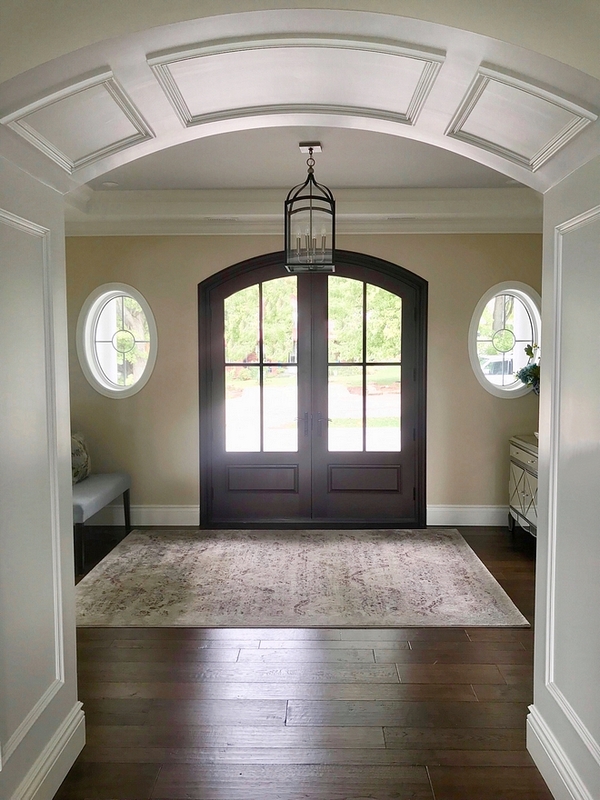 Notice the arched ceiling, the arched front doors, and of course, that lake view! 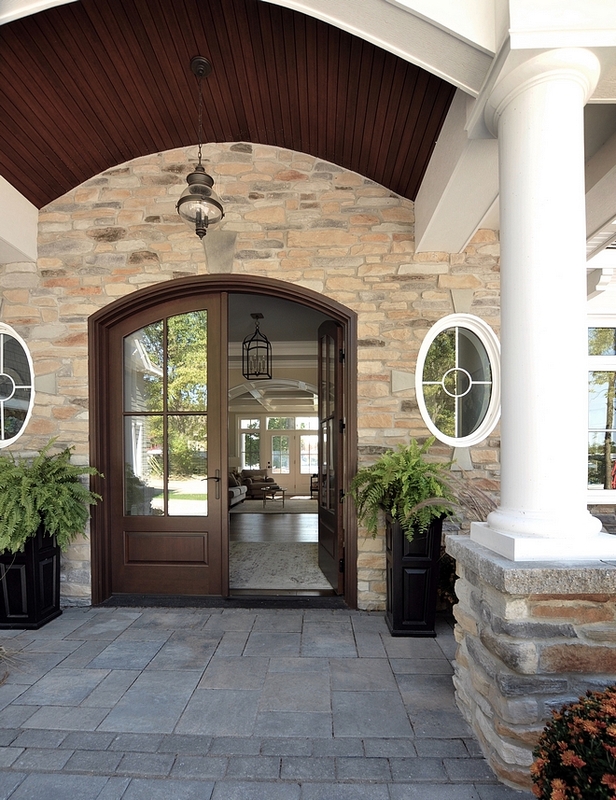 Door manufacturer and colour: Lepage Millwork stained in “Coffee”. 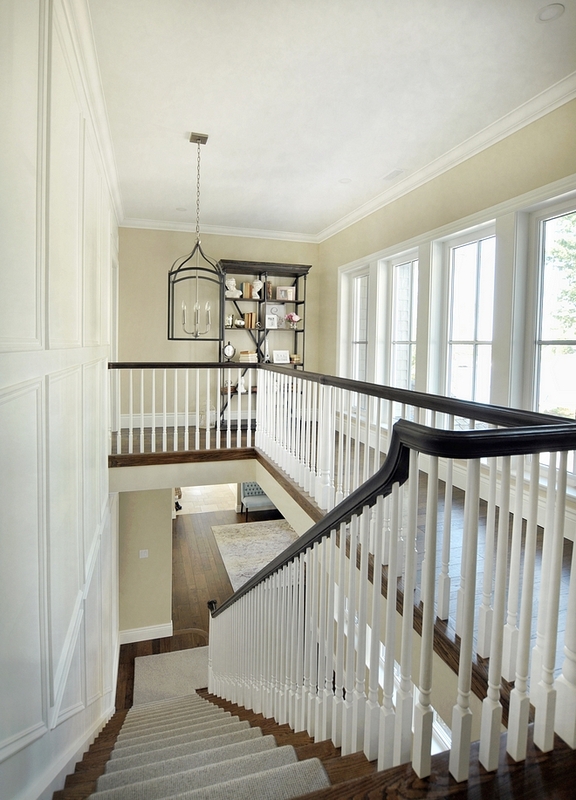 We wanted our home to have a warm, elegant and welcoming feel without it being too formal or “stuffy”. 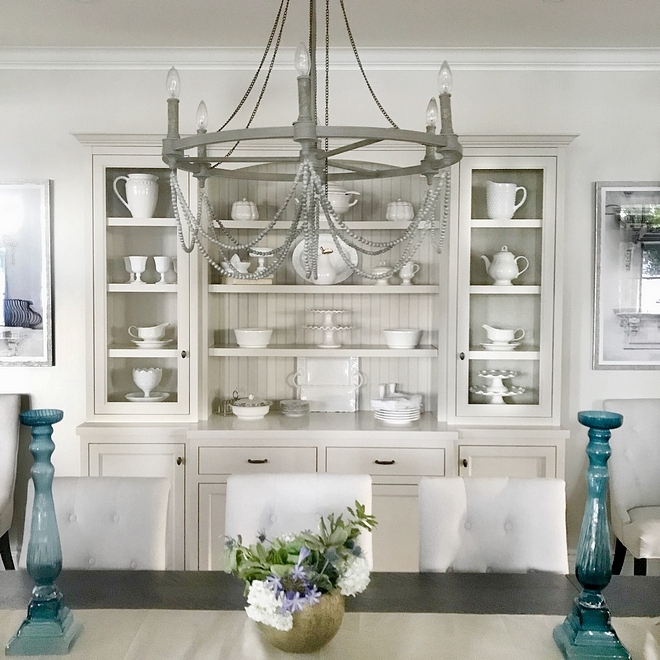 Chandelier: Hinkley 4 light Pendant & Here with 6 lights. Bench: Van Gogh – Other Beautiful Foyer Benches/settees: here, here, here, here & here. Rug: Omni Stevens – similar here, here,here & here. 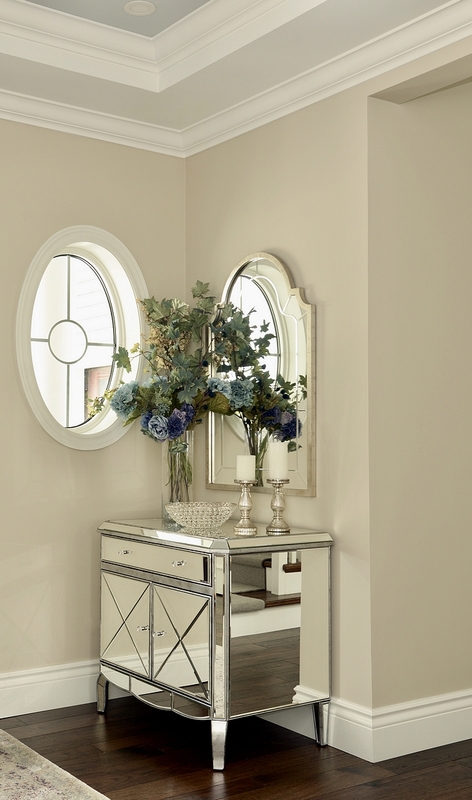 Mirrored console: Tribeca by Korson (local store) – similar here, here, here & here. 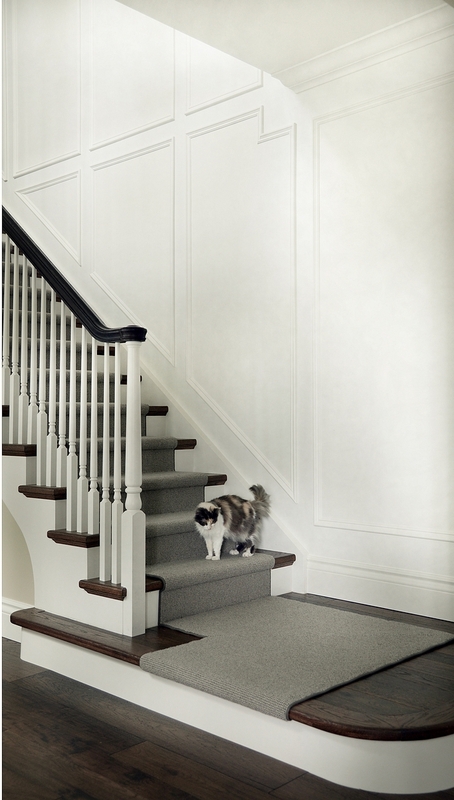 Flooring: Engineered Hardwood-Tailored Collection Sephia Hickory from Rona – similar here, here & here. An archway opens to the living room and frames the lake view. Our kitchen is the heart of our home. 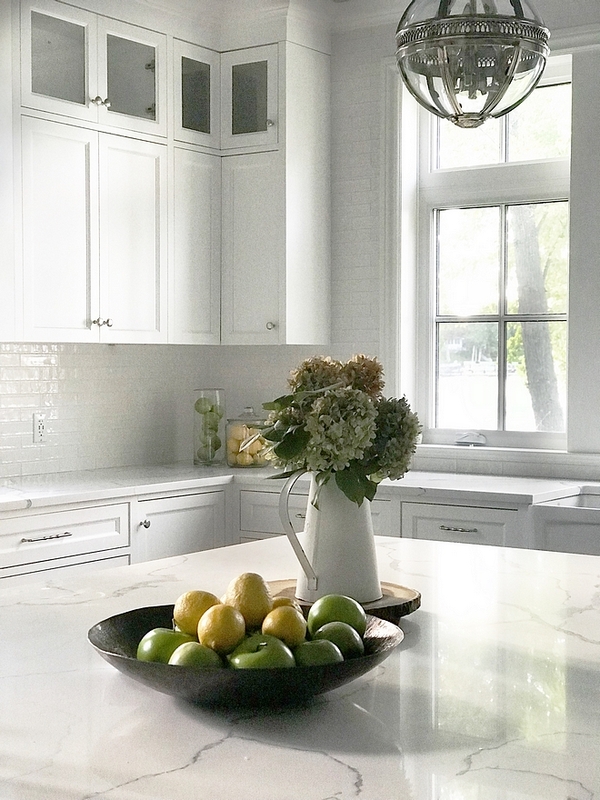 Located on the east side of the of the house, the kitchen enables us to enjoy our breakfast with sunlight streaming in the windows, and the afternoons bring an abundance of natural sunlight. The 5’ x 8’ island is a perfect size for prepping, dining or entertaining around. It contains a Fisher Paykeldouble drawer dishwasher fitted with custom panels, a fireclay undermount prep sink from Franke and special fittings in drawers to allow for adequate storage. 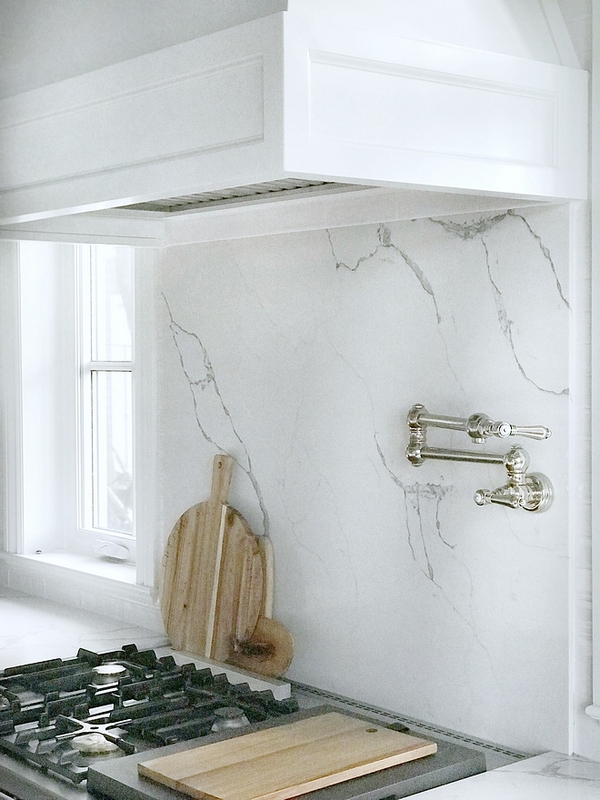 Backsplash is Statuary Classique from MSI Stone. Pot filler: Perrin and Rowe, polished nickel. Range is Lacanche Savigny. 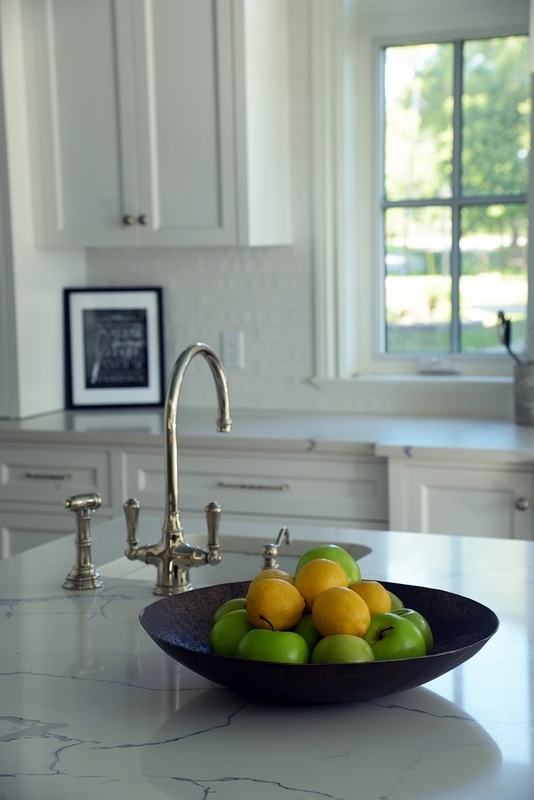 The Lacanche matte black Savigny model was purchased through the French Barn and was an absolute must to our kitchen. 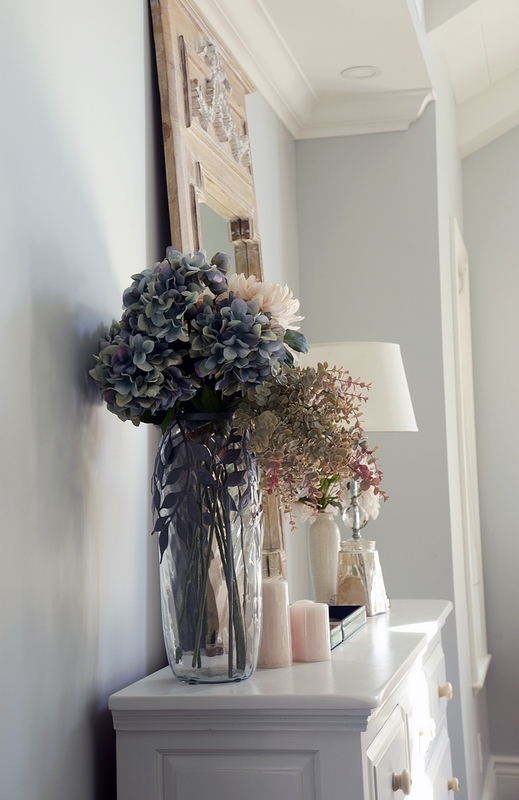 Cabinet colour: Benjamin Moore OC-117 Simply White. The fireclay main double sink is from the DXV collection from American Standard (similar here & here) with Rohl Perrin and Rowe kitchen faucet and soap dispenser in polished nickel. Dishwasher is a Bosch fitted with custom panel. 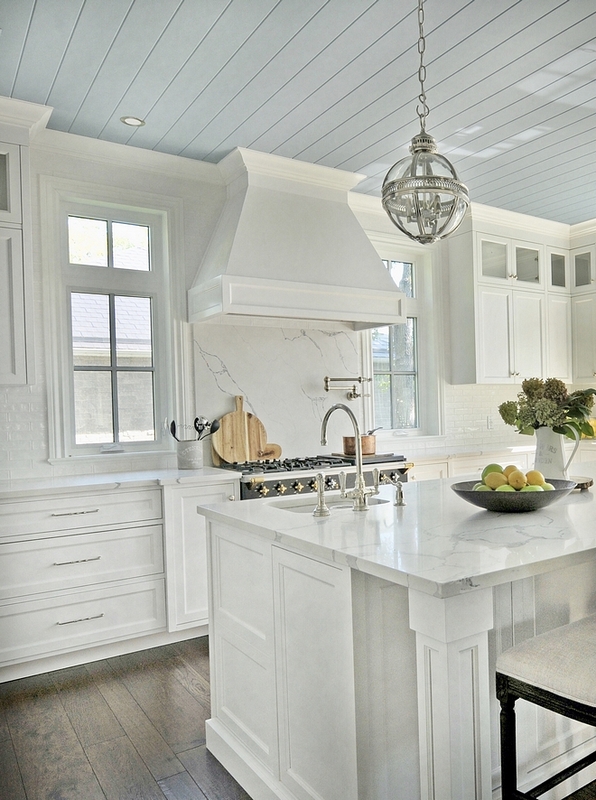 Backsplash is subway tile – similar here & here. 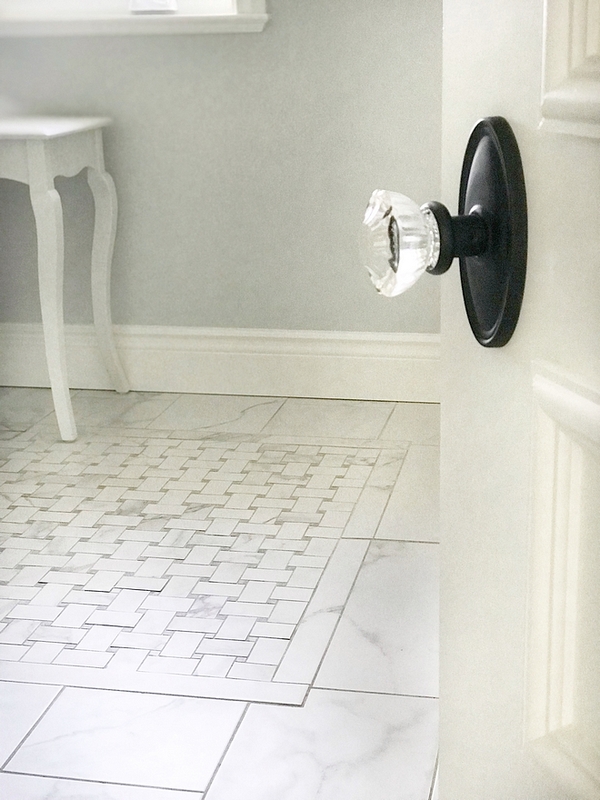 The kitchen hardware is from Richelieu – Pulls & Knobs. Along with a Lacanche range, another must for our kitchen was a tongue and groove ceiling, to give the kitchen a country feel. 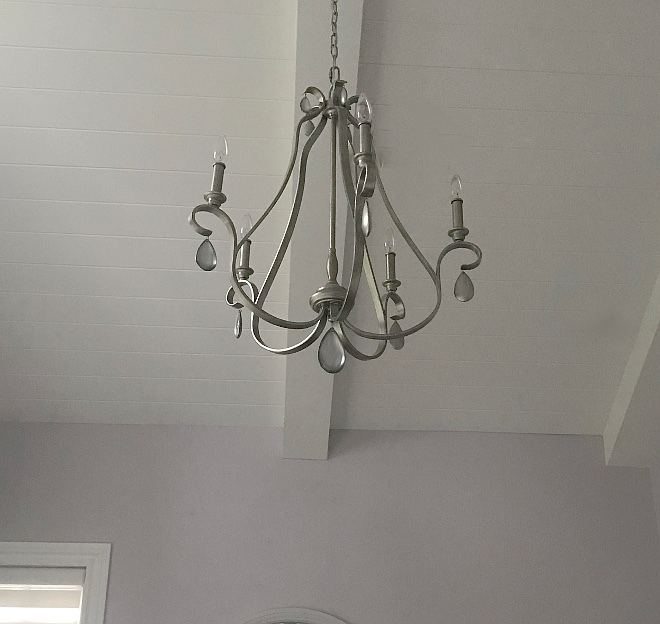 Ceiling colour: C2 paint -251 Argyle. Island lights are Restoration Hardware in polished nickel – similar here, here & here (OMG!). Counterstools are from Restoration Hardware – similar here. 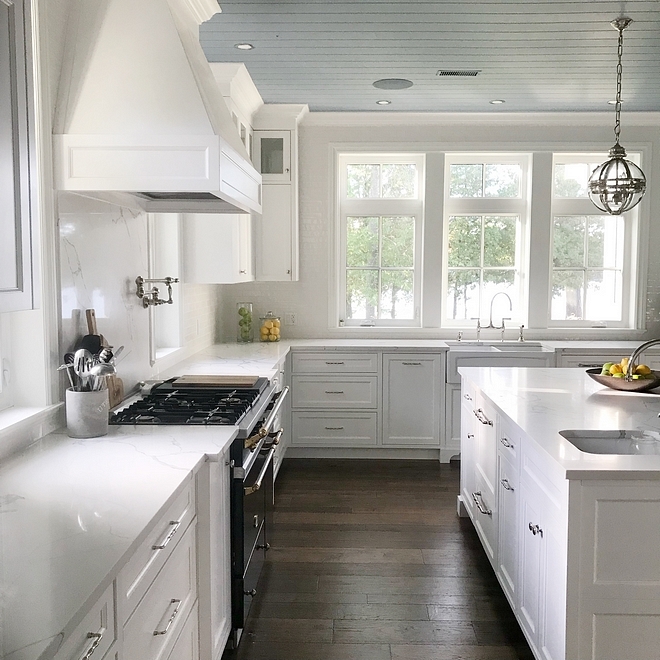 The kitchen pantry features custom cabinets, painted in Benjamin Moore Simply White, beadboard backsplash and blue plank ceiling. The pantry hardware is from House of Antique Hardware. Similar Glass Canister: here & here. Pendant: Wayfair – similar here. 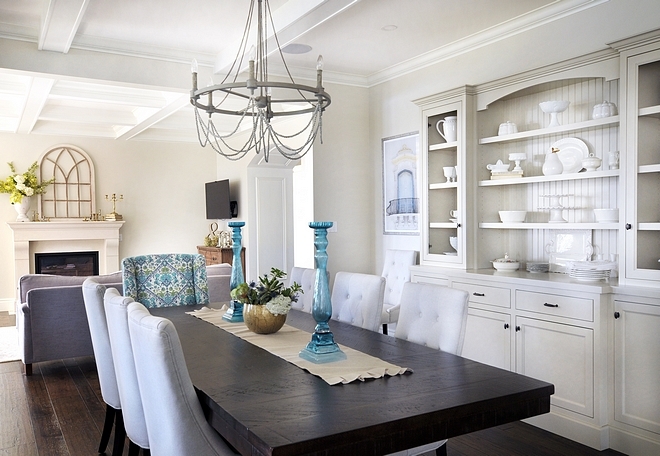 The kitchen opens to a beautiful dining room. Paint colour is Benjamin Moore OC-24 Winds Breath. Dining chairs: Korson (local company) – similar here. 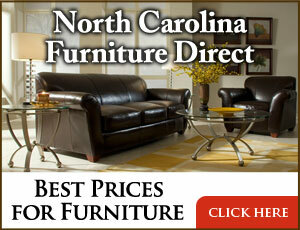 Dining Table: Ruff Sawn (local company) – Other Beautiful Dining Tables: here, here, here & here. 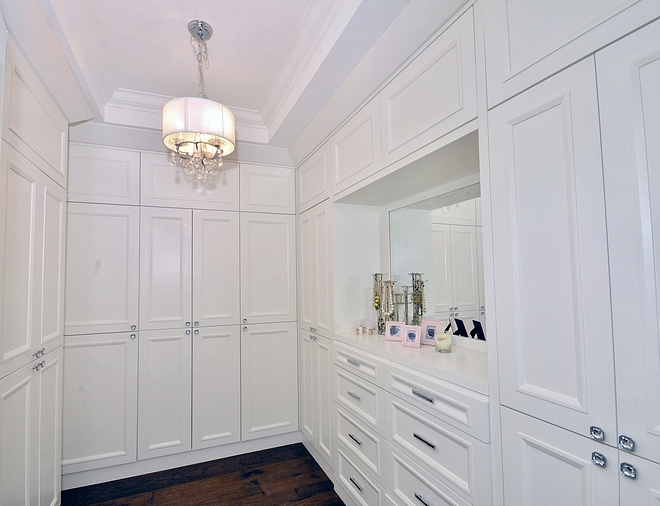 A custom cabinet provides display room for the homeowners’ white collectables. The hardware is from Amerock Knobs & Pulls. Host Chairs: Robert Allen upholstery. 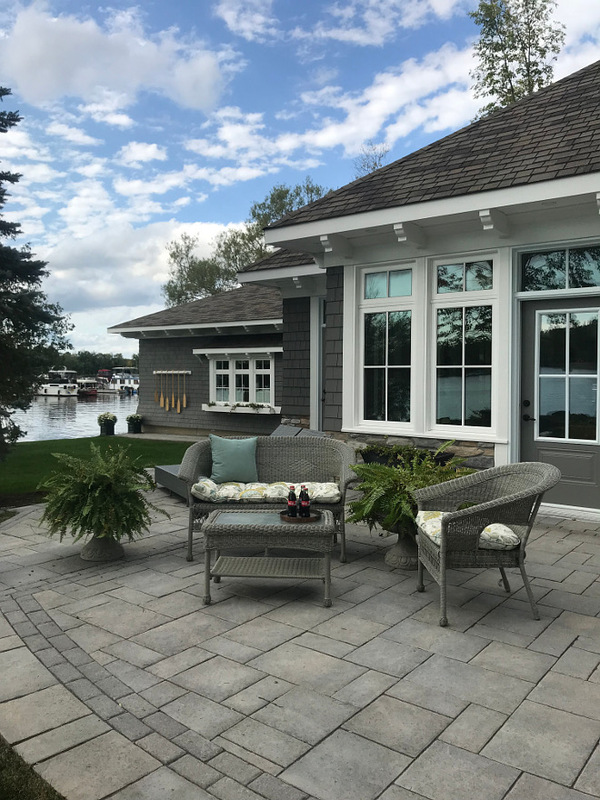 We utilize our living room primarily for entertaining during the cold winter months, as it still offers a beautiful lakeside view, while maintaining a cozy feel. 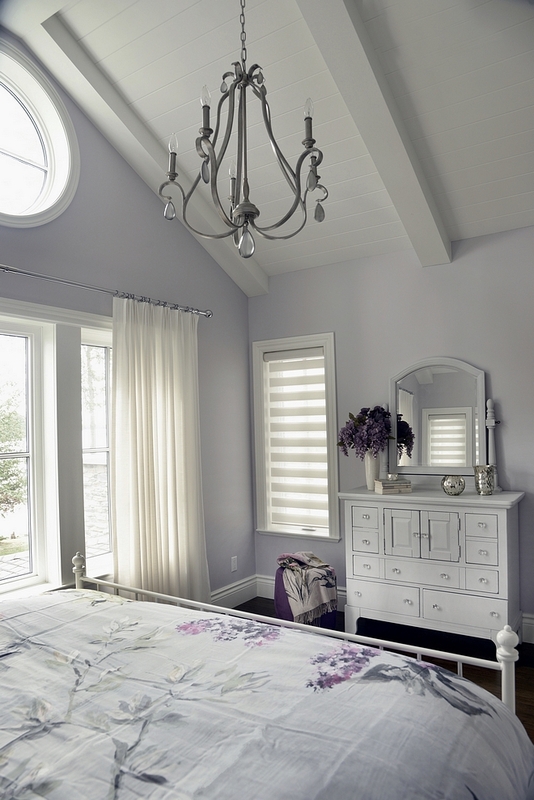 Ceiling and trim colour: Benjamin Moore Simply White. Coffee table, accent tables and side buffet – Korson (local company) – similar coffee table & side table. Rug: Omni Stevens – Other Neutral Rugs: here, here, here, here, here & here. Similar Window Pane Wall Decor: here & here. 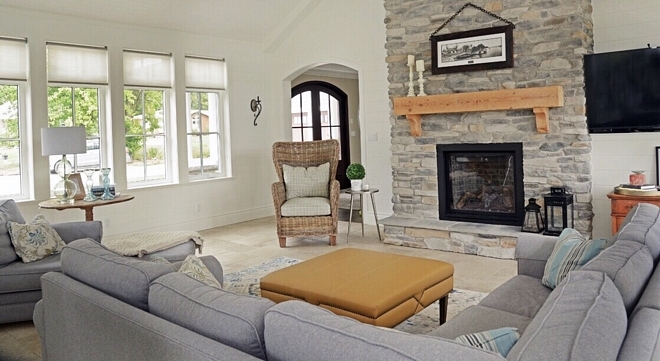 Anchoring the room is the cast stone fireplace surround from Multi-Cast Design Inc.
Sofa and chair: Van Gogh Designs Inc. – similar sofa & chair. Draperies: Robert Allen drapery fabric. 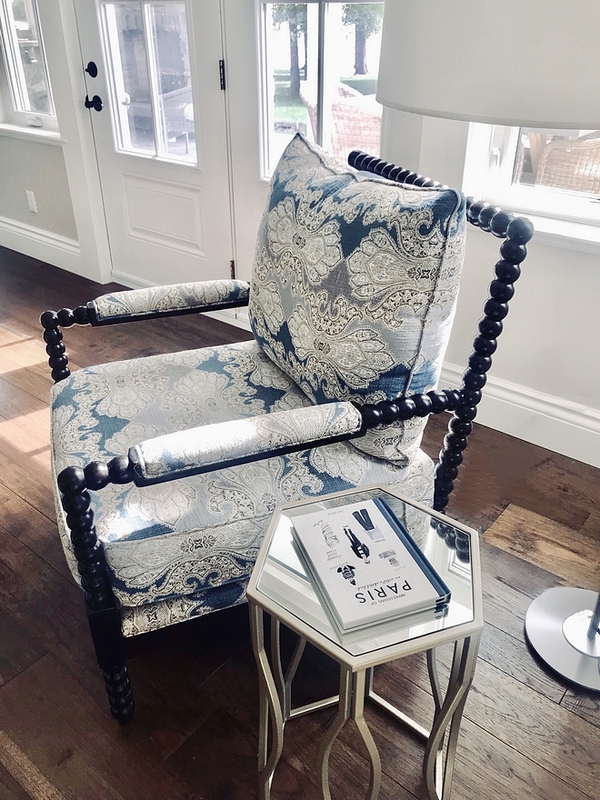 Spindle chair: Wayfair upholstered with Robert Allen fabric. 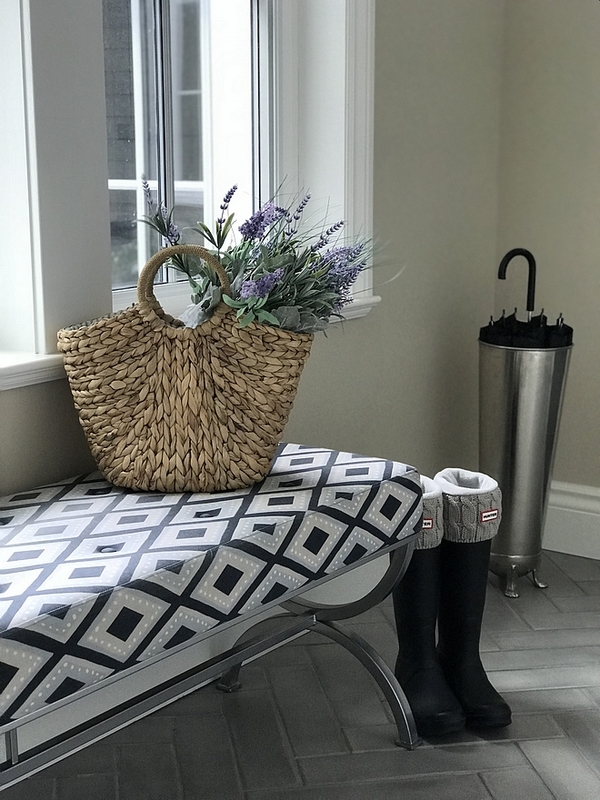 The classic herringbone tile design is always in style and effortlessly adds a romantic touch to the floor. 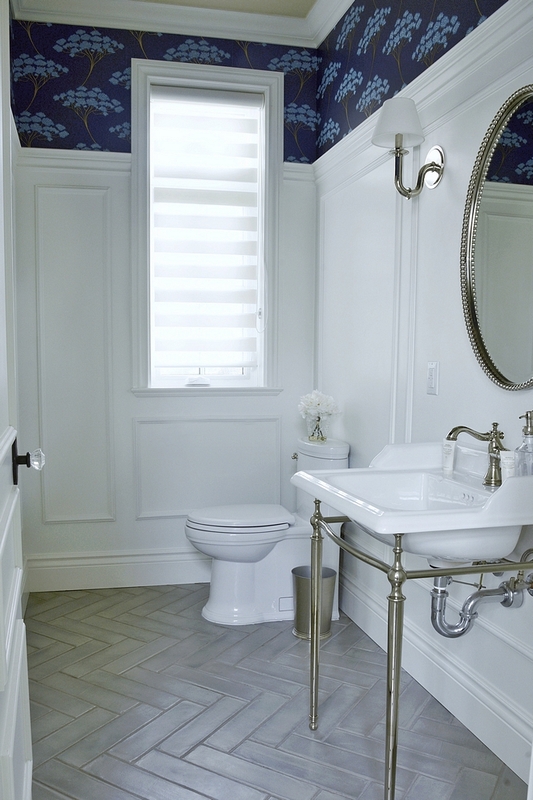 London Console Sink from Crosswater – similar here. 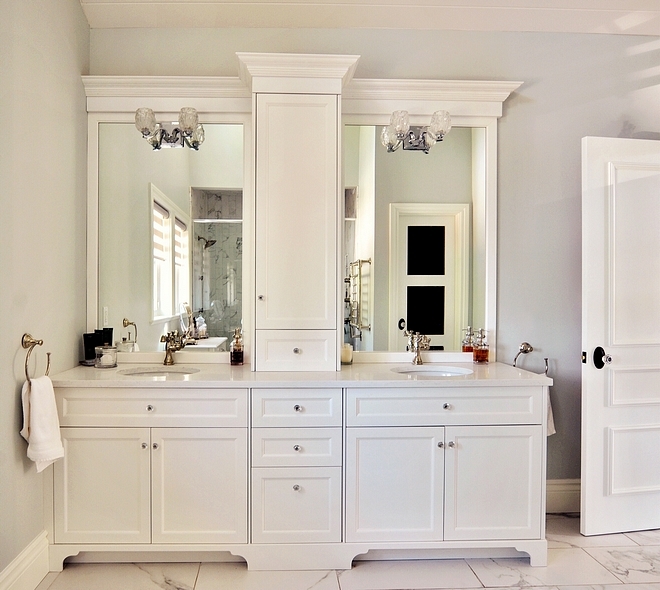 The mirror can be found here and the wall scones are from Wayfair. 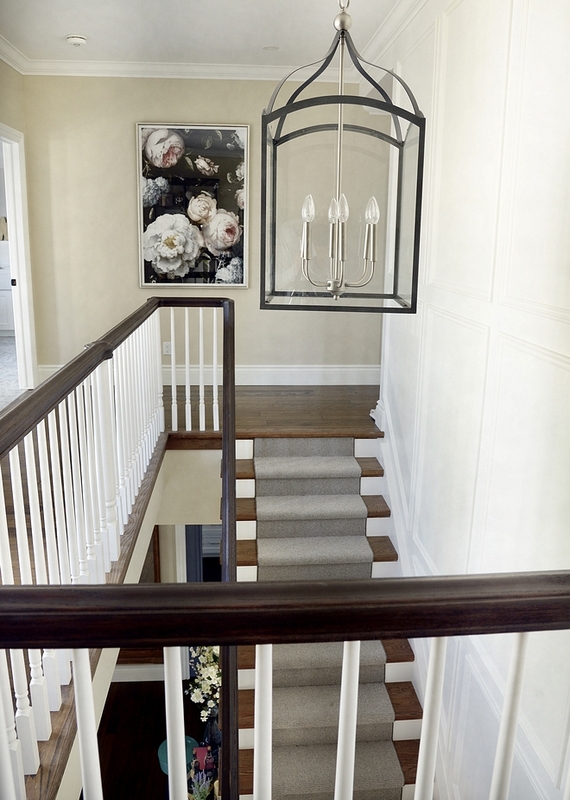 Wall paneling painted in Benjamin Moore Simply White. 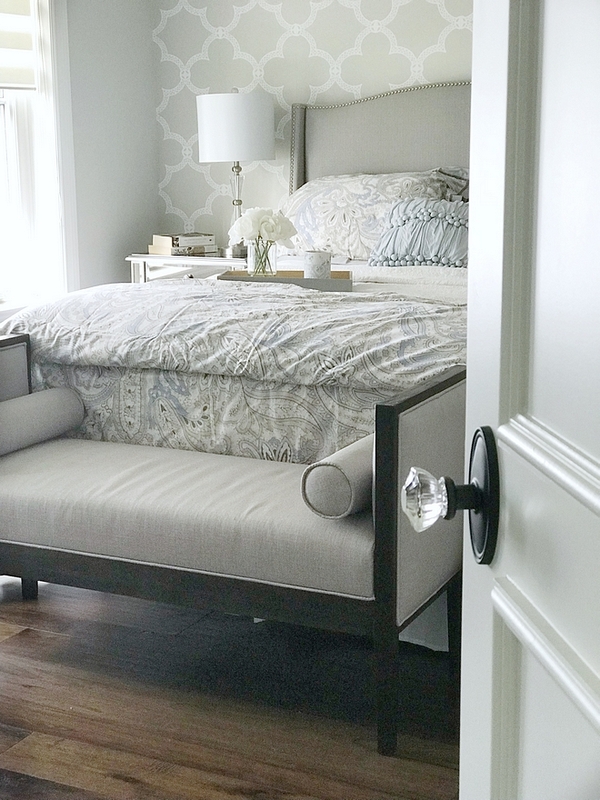 This guest bedroom features an inspiring color scheme of soft greys, blue and white. Bed: Wayfair – similar here. 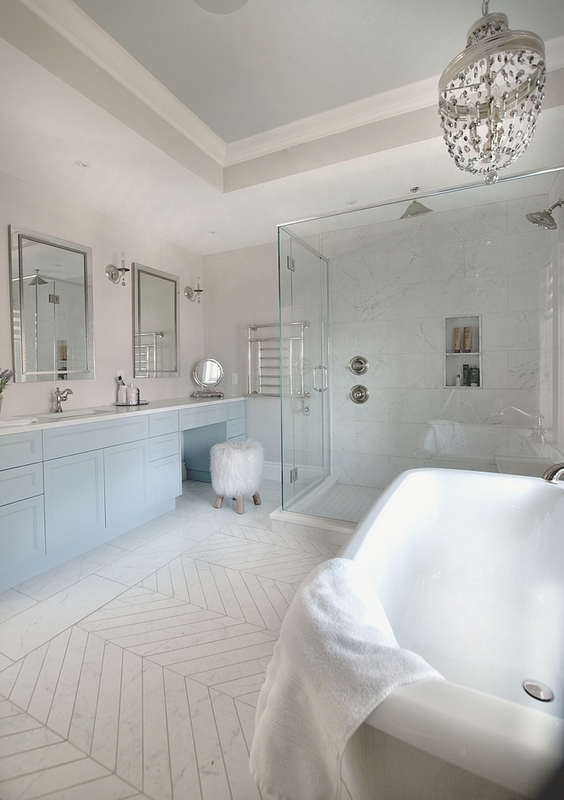 In the main bathroom, the lovely freestanding soaker tub is anchored by the heated, chevron-pattern tiled floors. 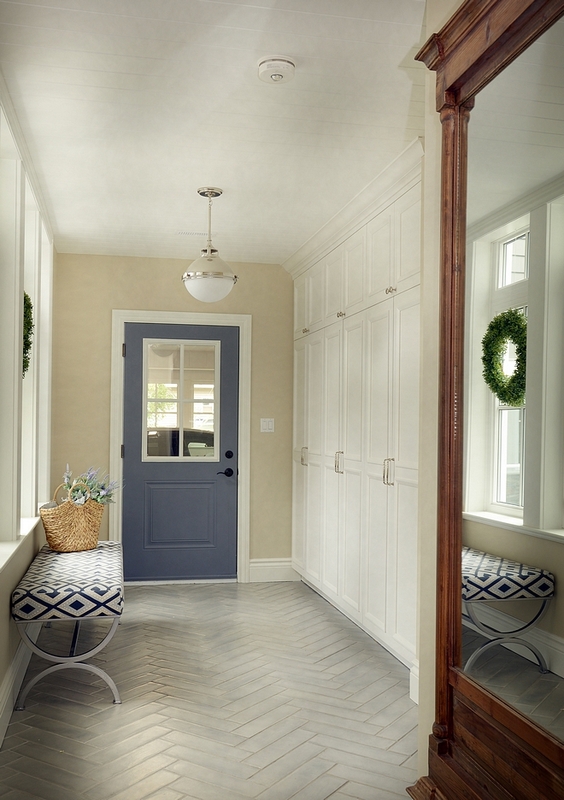 The hall features a built-in cabinet from Ikea painted Benjamin Moore Whickham Grey finished with Richelieu Hardware. 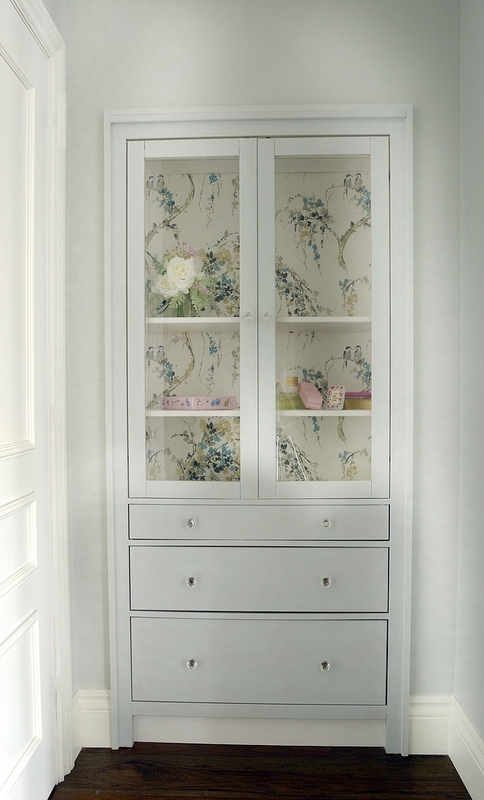 Wallcovering on the cabinet back is from York. The master bedroom has its own balcony that offers a stunning view of the lake. The tongue and groove cathedral ceiling adds height to the room, while the windows fill it with natural light, creating a relaxing vibe. 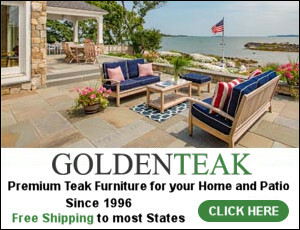 Bed: Wayfair Birch Lane – similar here. Bench: local store – similar here, here, here, here & here. Bedding: Cuddledown – Beautiful Bedding: here, here, here, here, West Elm (best bedding ever! 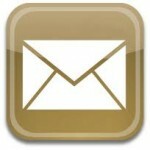 ),here & here. Drapery and hardware: Alendel Fabrics Ltd. Similar Faux Fur Runner: Here. 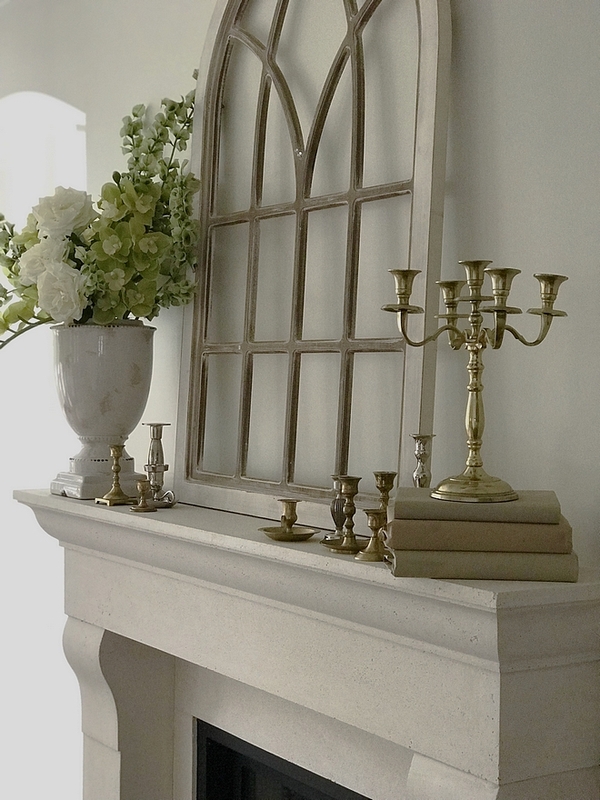 Mirror: HomeSense Canada – Other Beautiful Mirrors: here, here, here, here, here & here. 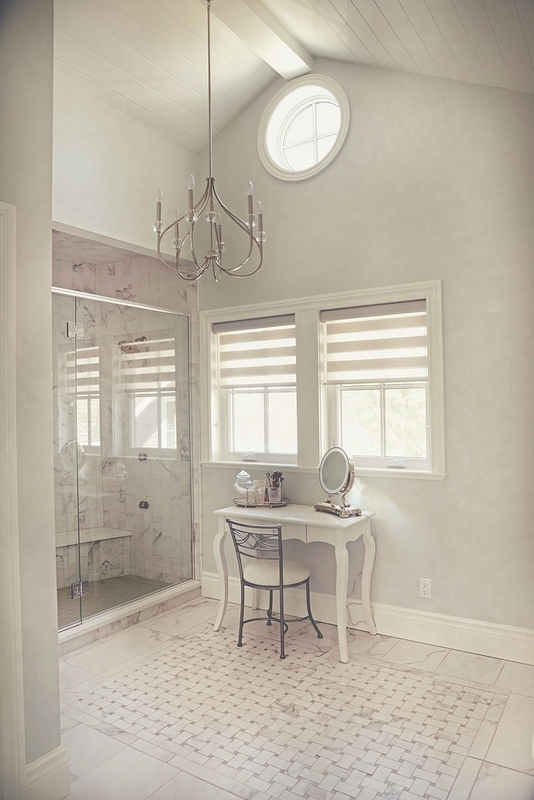 The wall colour from the master suite continues into the master bath, where there’s a striking shower area. The small mosaic floor tiles with the soft curve of the shower wall effectively work to enhance the spa effect. The multiple shower heads and jets create an exhilarating and relaxing shower experience. Doorknobs are from Emtek, Assa Abloy. 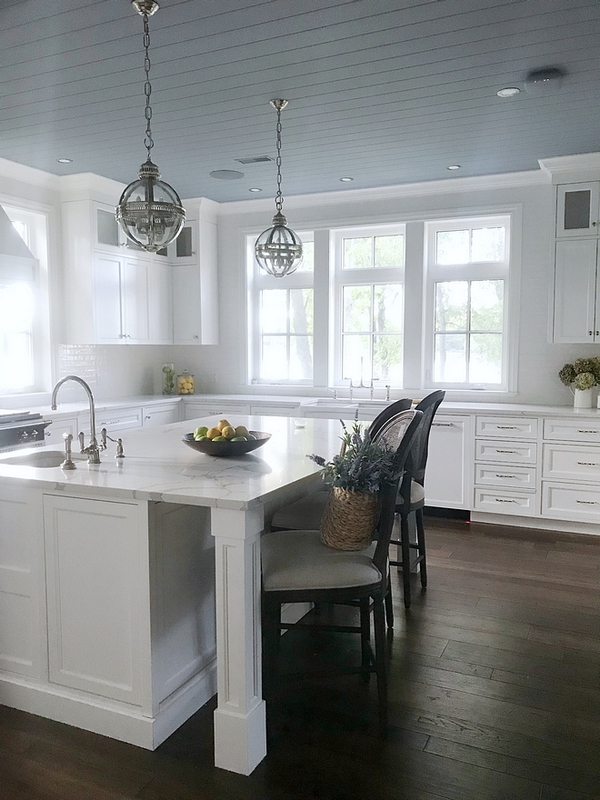 Custom cabinets from Alaska Wood Industries – Colour: Benjamin Moore Simply White. Cabinet pulls: Richelieu similar here, here & here. 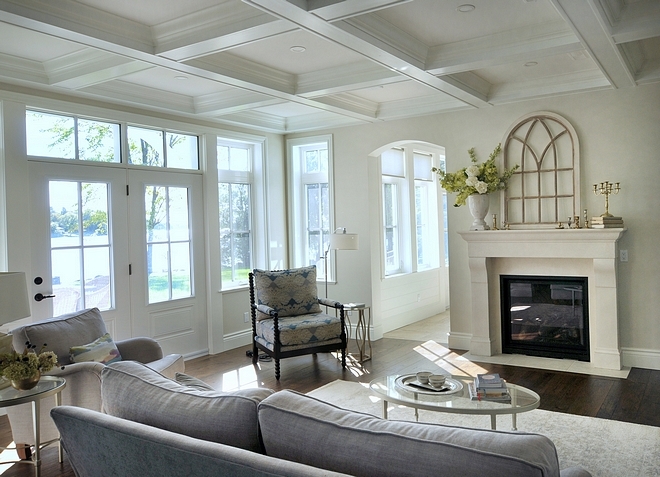 The high vaulted ceilings allowed for a full height traditional heritage stone fireplace. 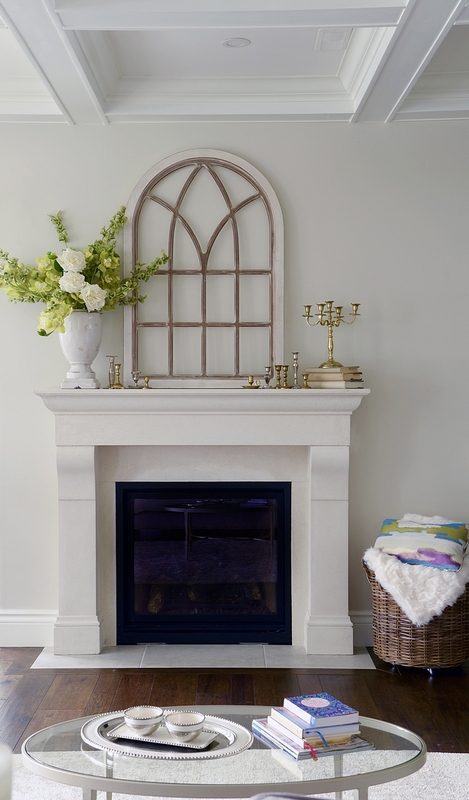 The mantle was salvaged and restored from the original cottage on the property. 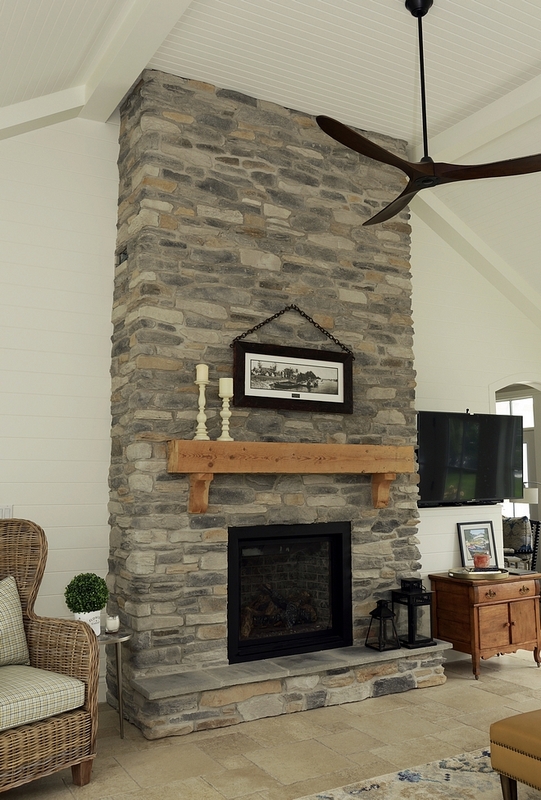 The white shiplap walls lend nicely to the cottage feel. The old-world look tile floor is from Preston Hardware. 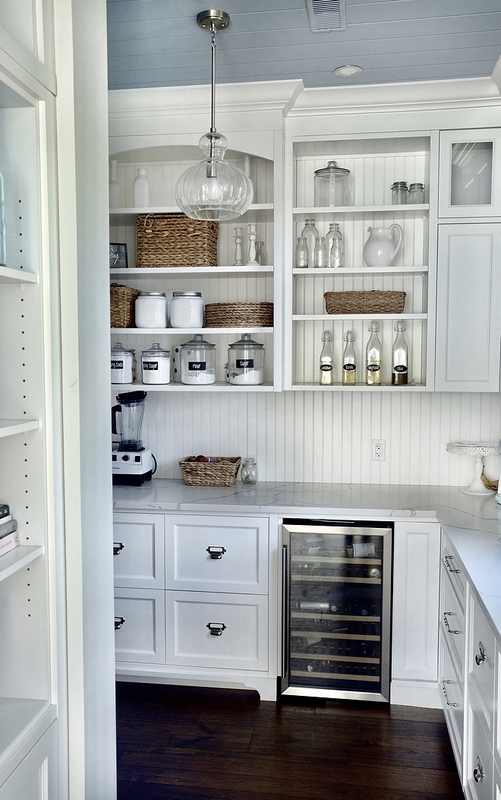 The custom built-in mudroom cabinets are spacious enough to hold shoes, jackets and miscellaneous cleaning supplies. 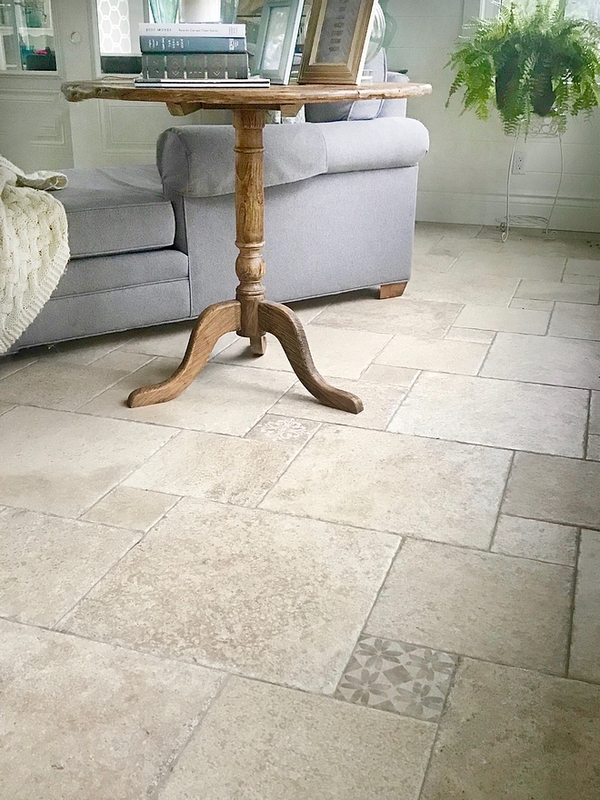 Herringbone tile: Euro Tile and Stone. What a dreamy lake house! Loveseat and chairs: Country Living from Sears Canada – similar here. 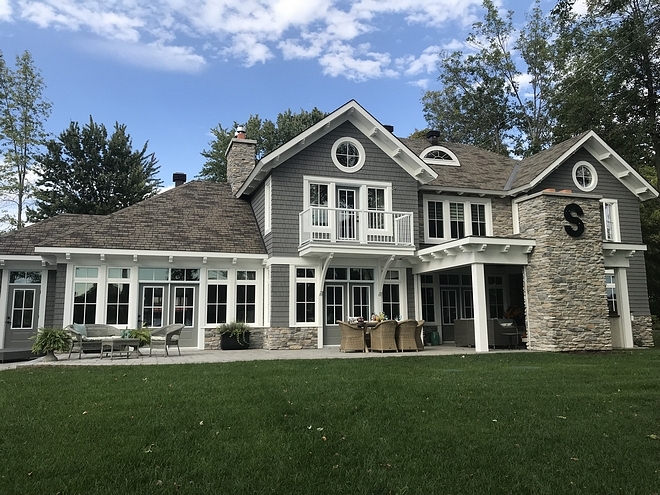 The exterior cedar shake colour is Bar Harbor Blue from Maibec and the stone is a mix of Prestige Ledgestone and Natural Blend from Brampton Brick. The windows are from KV Windows. 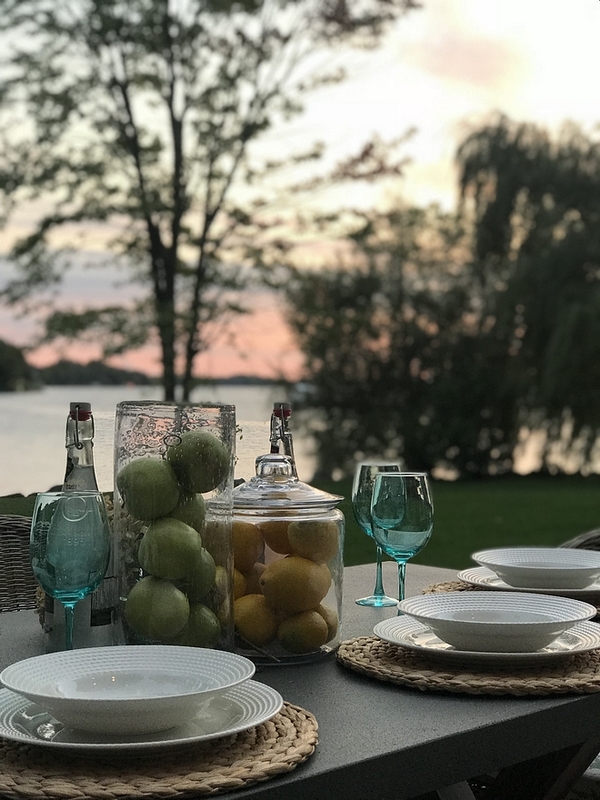 We take full advantage of stunning views and spacious outdoor area by frequently entertaining at our lakeside dining table. The ever-changing sunset views are magnificent, and make every night a treat. 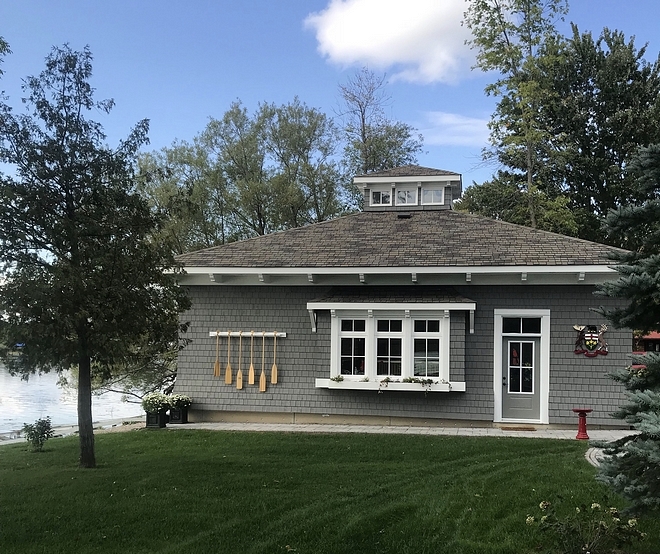 Our boathouse is home to all of our lake toys, while complimenting the architectural design of the main house. I would like to thank Luciane once again for this wonderful and exciting opportunity to be featured on her blog. 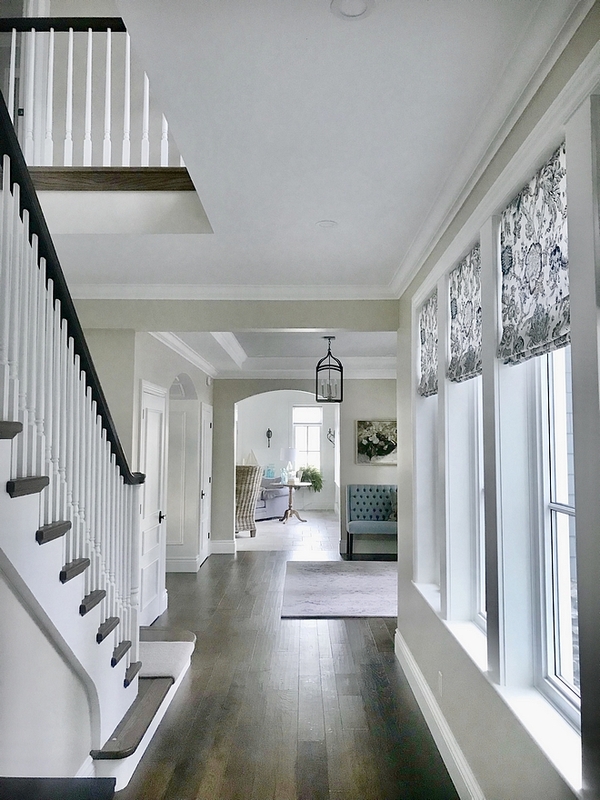 I would also like to thank you for taking the time to tour our home, and hope it inspired you the way I have been constantly inspired by HomeBunch. Many thanks to Pamela for sharing all of the details above. Make sure to follow @Pamela.Saumure on Instagram for more inspiration! Photography by Steve Maddock, Hy Fund Studios.